Change happens! It’s inevitable; it’s all around us. Challenging as it is, change can be a good thing. Sometimes, change occurs almost as an evolution, a natural flow of events, as in the case of a successful marriage and family therapist who became aware of a need in the mental health profession and set changes in motion to help fill that need. Sometimes, change is thrust upon us and can wreak havoc with our lives. When a human resource specialist found herself among the unemployed, the challenge seemed overwhelming. But in the ensuing months, she became aware of a need she shared with her fellow job seekers beyond finding work. Meeting that need helped her move on with her life. Sometimes, we realize that life isn’t quite what it should be, and we set about to make it better. For example, the corporate executive who felt the need to spend more time with family and less time commuting to work or the full-time working mom who wanted to spend more time at home with her daughter. Whether it happens to us or we make it happen, change can be good. For these four newly re-energized CLU alumni, the transition to a new direction, a new career, a new business started with a first step – embracing the changes that would lead them down more fulfilling professional paths. As a licensed marriage and family therapist, Noah Rubinstein ’94 believes that therapy has great powers to heal. Unfortunately, it can also do harm. Over the last 20 years, Rubinstein has provided counseling and consultative services in a variety of settings including private practice, mental health clinics, residential treatment centers, emergency shelters, hospice organizations, home-based therapy programs, summer camps and schools. Having heard a few too many stories about therapists treating clients as flawed, deficient, unlovable, or worse, Rubinstein launched GoodTherapy.org, an online mental health directory designed to help people find practitioners who view and treat their clients as fundamentally capable and proficient human beings. “Our experience is that nearly everyone has an innate capacity to return to their loving and happy self if they put in the time and energy, and have a good therapist to help guide them,” said Rubinstein, who lives in Olympia, Wash., with his wife, Charlene (Koutchak ’93) and their two sons. The difference between Goodtherapy.org and other online directories is the requirement that listed therapists adhere to healthy elements of therapy including practices that empower and engage clients as collaborative partners in the healing process. Launched in 2007, the site currently has 6,000 registered members in 27 countries and receives 1.2 million therapist searches each month. Committed to helping people gain a better understanding of what constitutes healthy therapy, GoodTherapy.org is also a resource for blogs, online workshops and book recommendations. 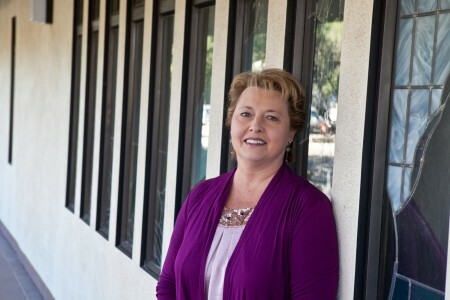 After losing her job in March 2008, Thousand Oaks resident Lauren Godfrey ’85 found herself navigating a mid-career job search in a brutally competitive job market. As the months passed, she met more and more people out of work due to recent changes in the economy and felt that the typical networking events weren’t addressing the harsh realities that she and others were experiencing. The anxiety, loss of self-esteem and financial setbacks that come with a prolonged job search make it difficult to maintain a positive and upbeat attitude – the kind of attributes that employers are looking for. all of whom provide their services on a sliding scale or pro bono basis. With continued community support, Godfrey hopes that Vocare (from the Latin verb “to call”) will be able to provide scholarship-based job training and advanced certification to people stranded by unemployment. “I see a lot of people that keep falling short in securing a job because of a missing certification or qualification, and they’re in the agonizing position of either paying the rent or mortgage, or paying for that training. It’s a vicious cycle and just a little bit of help can change the game,” Godfrey said. After 21 months in transition, Godfrey landed a job as a Lutheran Engagement Specialist with Thrivent Financial for Lutherans, a position she sees as her true calling. 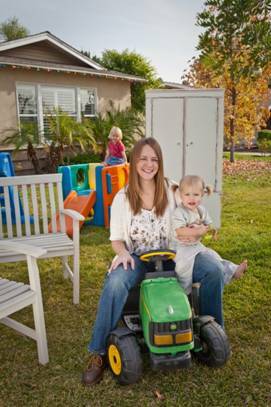 Michele (Thompson ’02) Rivard of Glendora was a full-time working mom with a healthy freelance marketing business on the side. The configuration left little time to be a mom, and her freelance business was doing well, so Rivard decided to give up her day job in order to spend more time with her daughter. Soon after that, the market crashed and all of her freelance clients closed, merged or simply cut their marketing budgets leaving her without an income. But Rivard, now the mother of two daughters, knows a bargain when she sees one. While at a garage sale, she came across a sturdy antique secretary’s desk in need of a little TLC. She bought it for a steal, painted it, added some inexpensive hardware and sold it on Craigslist for a $100 profit. 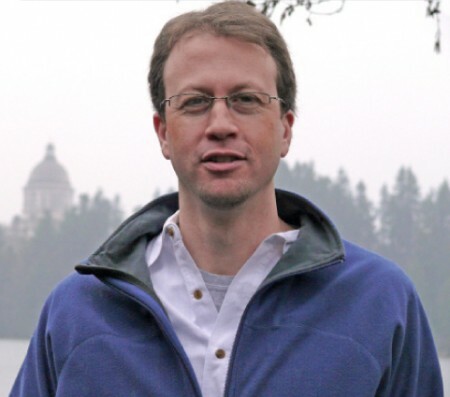 A few years ago, Mark Howe ’88 set out to make a change. He had a lucrative job and 20 years in corporate finance, but the commute and the long hours were getting to him. It was just too much time away from his two daughters. Longing to open his own business, Howe had his eye on a vacant storefront near his home in Moorpark. He felt the area was in need of a good coffee shop and while doing research on various franchises found one that spoke to his heart. Not long after, Java Kai was born. Howe had spent some time in Hawaii as a child, so he liked the idea of bringing a little “island attitude” to his California neighborhood. 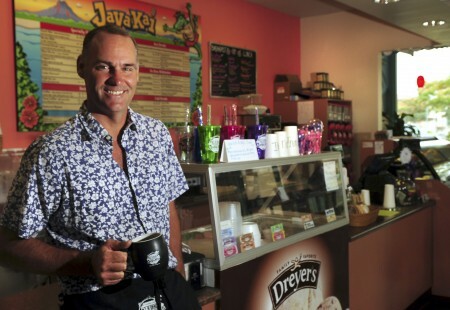 And so, paying tribute to Hawaii, family and the “best darned” coffee you’ll find on the mainland, Howe and his wife, Sandy, opened the doors of Java Kai. According to the proud owners, Java Kai is the only place in town where you can get a cup of 100 percent Kona coffee – coffee grown only in Hawaii and considered to be among the world’s finest. For those who don’t like coffee, Howe can serve up a Lava Lust, Molokai Mango or Hula Hula smoothie to suit your mood.